A THREE-AND-a-half year suspended prison sentence has been imposed on All-Ireland winning Tipperary goalkeeper Darren Gleeson after he admitted obtaining €10,000 by deception from an elderly man who was a financial client of his. Nenagh Circuit Court heard that the 36-year-old star hurler had a “significant gambling problem” for which he has been in counselling since 2015, having made a “large number of transactions” with Paddy Power, and also lost money through investments made prior to the economic crash. Gleeson, who is due to line out for the defending All-Ireland champions in their championship qualifier match against Westmeath this weekend, pleaded guilty this morning to a breach of Section 6 of the Criminal Justice (Theft and Fraud Offences) Act 2001. The 36-year-old from Shesharoe, Portroe, Co Tipperary, had been charged with two counts of stealing a total of €32,000 from a Timothy Heenan (80) in 2013, and two alternate counts of obtaining the same monies by deception. Justin Dillon SC, for the State indicated that the plea to one count of deception, relating to a sum of €10,000, was acceptable to the DPP, subject to the facts of the other deception charge being put before the court. The State has entered a “nolle prosequi” in relation to the theft charges. Darren Gleeson was Tipperary’s starting goalkeeper when they beat Kilkenny in last year’s All-Ireland senior hurling final and was a substitute when they won against the same opposition in 2010. He has also won six Munster championship medals, an All-Star award and a National Hurling League medal. Detective Garda Martin Connolly told the court that, on different dates in 2013, Timothy Heenan had separate sums of €10,000 and €22,000 to invest. He gave cheques in these amounts to Darren Gleeson, who was the director of a financial services company in Nenagh at the time. One cheque was made out to “D Gleeson” and the other to “Darren Gleeson”. The Garda told the court that there appeared to be some over-writing or under-writing on the €22,000 cheque, with the letters “PTSB,” for Permanent TSB, visible underneath. He was asked to investigate the matter after Gleeson’s own bank contacted the gardaí with “concerns” about transactions. He met up with Mr Gleeson a number of times, on a voluntary basis, and on one occasion the accused said he had been given the money by Mr Heenan “as a loan”. He also said that Mr Heenan and himself signed a loan agreement. This was put to Mr Heenan who said the money “was not a loan” and was meant to be invested. During one Garda interview, Gleeson was asked if he had “a problem with gambling” as he was spending “vast amounts of money”. Gleeson’s bank statements showed “a very large number of transactions in favour of Paddy Power,” the court heard, and in one statement a credit amount of €48,000 had reduced to €23,000 “in a short period of time”. The money received from Mr Heenan had since been repaid, with interest, the court heard. 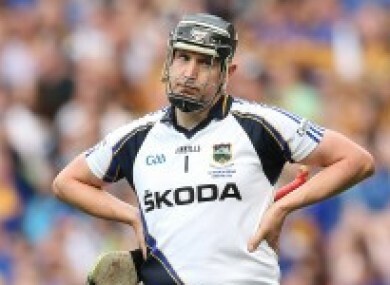 Mr Heenan didn’t want to see Darren Gleeson go to prison and wanted him to continue hurling. The court heard that Mr Gleeson’s career in finance is over and he has since secured employment with a mechanical services company. His employer, John Lenihan, gave evidence on his behalf and said he was an “exceptional” employee. Hurling coach with Gleeson’s Portroe club John Sheedy, himself a former Tipperary goalkeeper, said he always regarded Darren as “a great leader” who is now in charge of the club’s under-21 footballers. All the young players look up to him. John O’Kelly SC, defending, said Mr Gleeson had a “serious problem with gambling” and handed in a report from a counsellor who said he had been attending counselling since September of 2015, sometimes twice weekly. “At a certain stage, this was almost out of control,” Mr O’Kelly said. But this wasn’t how his financial difficulties initially arose. He also became involved in Contract For Difference (CFD) financial products. He had since apologised to Mr Heenan, the court heard, and accepted that what he did was “completely wrong” and he had always intended to repay the money. “Unfortunately, as people with problems with gambling very often find, they are always hoping that the next investment will put them right.” He had sold his shares in the business to help repay the money. The court heard Mr Gleeson is married, with three children, and had no previous convictions. O’Kelly described it as “an unusual case and a tragic case”. Judge Teehan said the most “glaring” aggravating factor was the “abuse of trust” committed by Mr Gleeson against Mr Heenan and that the total of €32,000 was “a not insignificant amount,” while the subterfuge involved and the explanations about it being a loan were also aggravating circumstances. He put the matter “towards the bottom of the top range” for such offences. Mitigating factors were the guilty plea, his co-operation with gardai, the apology to Mr Heenan, and that he was in rehabilitation since 2015. It was clear that Mr Gleeson had “gambled very significant amounts” of money and this was against a background of some “unwise choices, financial, during the good years and during the years that followed”. Two problems which would endure were his gambling addiction and also the “shame” he would suffer throughout his life, for what he did. He imposed a three-and-a-half year prison sentence, suspended for three and a half years, and told Mr Gleeson to keep the peace for that time, continue attending counselling, and not to gamble in any form. Email “Tipperary hurler gets suspended sentence after obtaining €10,000 from elderly man by deception”. Feedback on “Tipperary hurler gets suspended sentence after obtaining €10,000 from elderly man by deception”.